Every year at the end of August, traffic inevitably seems to get a little bit heavier as those bright yellow school buses start their daily routes. It's easy to get frustrated if you are behind a school bus as it makes a dozen stops to pick up students — especially if you are already running late. But adding a few minutes to your commute should be a small price to pay for the safety of the more than 1.5 million students transported daily in Pennsylvania. In Pennsylvania, it is illegal to pass a school bus when its red lights are flashing and stop arm is extended. If convicted of breaking this law, you could get a $250 fine, five points on your driving record, and a 60-day suspension of your license. In 2016, 730 motorists were convicted for breaking the state's School Bus Stopping Law. As part of the law, motorists are required to stop at least 10 feet away when behind the bus, meeting the bus, or approaching an intersection where a bus is stopped. Motorists following or traveling alongside a school bus must also stop until the red lights have stopped flashing, the stop arm is withdrawn, and all children have reached safety. It's important to note that if physical barriers such as grassy medians, guide rails, or concrete median barriers separate oncoming traffic from the bus, motorists in the opposing lanes may proceed without stopping. The onus of back-to-school safety doesn't fall only on motorists, though. It's important for parents, students, and school bus drivers to be aware of safety tips, as well. Get to the school bus stop five minutes early, so you won't have to run across the road to catch the bus. Wait until the school bus has stopped all traffic before stepping out onto the road. When the school bus is moving, always stay in your seat and sit facing forward. Never put your head, arms, or hands out of the window. Always obey your school bus driver's instructions, so that he or she can make safe decisions. Never play with the emergency exits. Backpacks, band instruments, or sports equipment may not block the aisle or emergency exits. If there is an emergency, listen to the driver and follow instructions. Be reliable and dependable — your students count on you every day! 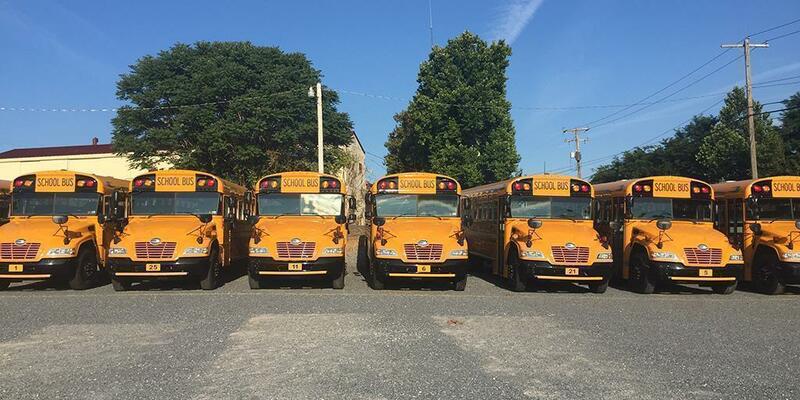 Check to make sure all children unloading from the bus are at a place of safety before deactivating your eight-way light system and moving the school bus. Do not allow children to exit the bus before all traffic has come to a complete stop and the safety equipment has been engaged. After unloading all children at the school or after your last stop, make sure to do a post-trip inspection of your bus and check to make sure that no child has been left on the bus. Be prepared to act appropriately in emergency and crash situations. Your actions could mean the difference between life and death. Always follow the proper steps when approaching a railroad crossing. For more information, please visit the Operation Lifesaver website. If you see or hear an emergency vehicle, you should be aware that although the emergency vehicle is required to come to a complete stop when it encounters a school bus loading or unloading students, it is legal for it to proceed with caution even if the bus's eight-way light system is still activated, as long as it doesn't risk the safety of the students.